1996 AMADA APELIO III 357V CNC TURRET PUNCHLASER MACHINE, 58 STATION THICK TURRET, 2 AUTO INDEX, FANUC 16-L CONTROL, 33 TON CAPACITY PUNCH, 1.5KW LASER, TORIT DUST COLLECTOR, CHILLER, S/N 33570188. AMADA VELAII 355, 33 TON TURRET PUNCH, 44 STATION, FANUC 6M, THICK TURRET, S/N VII55691. AMADA RG-80, 88 TON X 98.7’’ HYD PRESS BRAKE, WITH NC9EX 3 AXIS CONTROL, S/N 806477. 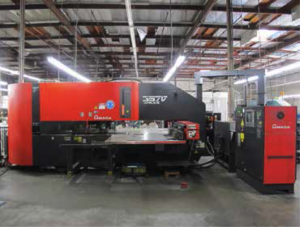 AMADA RG-25, 49.3’’ X 25 TON HYD PRESS BRAKE, WITH AUTOGAGE 150 CNC BACK GAGE. LARGE SELECTION OF AMADA PRESS BRAKE TOOLING. LARGE SELECTION OF AMADA THICK TURRET TOOLING. AMADA SPH-30C, 33 TON CNC PUNCH WITH AMADAN-SS SYSTEM II CONTROL. AMADA CS-220 HYD CORNER NOTCHER, 10GA CAPACITY, S/N 544938. AMADA MODEL S-1244 MECHANICAL POWER SHEAR, 48’’ X 11 GA CAPACITY, S/N 12321806. CONTINENTAL INT MODEL 120A, AUTO FEED HORIZONTAL BAND SAW. TIMESAVER 25’’ WIDE BELT GRAINER, MODEL 6025, S/N 206025MT28. PEM SERTER SERIES 4 HYD INSERTION PRESS. HAEGER 6 TON HYD INSERTION PRESS WITH BOWL FEEDER. 2) ROPER WHITNEY MODEL 58 KICK PRESSES. DRILL PRESSES, GRINDERS, SANDERS, AND DEBURRING TOOLS. TENNSMITH 36’’ X 22GA HAND ROLLS. CLARK VERTICAL MILLING MACHINE WITH SINO DRY, P.F. TABLE, VAR SPEED. 2004 ISUZU 14FT STAKE BED TRUCK, GAS, 42,000 MILES, AUTO. KOMATSU MODEL FG25S, 5000 LB LPG FORKLIFT, 2 STAGE. LARGE SELECTION OF MATERIAL, SHEET METAL ON PALLETS. LARGE SELECTION OF RACKING, SHELVING, AND CARTS. LARGE SELECTION OF LISTA CABINETS, WORK BENCHES. MOBILE OFFICE, 8FT X 8FT WITH AIR CONDITIONING. TRW STUD WELDER SERES 2000, MODEL100. MILLER 400 AMP TIG WELDER. THERMAL ARC TIG WAVE 250 WELDER. MILLER MIG 30 POWER WELDER. LORS SPOT WELDER MODEL 1150AP-440, WITH ABSOLUTE CONTROL. INSPECTION TOOLS, GAGES, MICS, CALLIPERS, BORE GAGES, AND ETC. KAESER AS-30, 30 HP ROTARY AIR COMPRESSOR WITH DRYER AND TANK. 2) ABRASIVE BURR BENCH VIBRATORY TUMBLER.